Fluropon Effects Nova BlackWausau, Wisconsin - Highlighting its stretch forming and finishing capabilities during the American Institute of Architects (AIA) Convention and Expo, Linetec displays curved aluminum extrusions finished in Valspar's Fluropon® Effects new Nova color family. Stretch Forming by Linetec allows architectural product manufacturers to have their metal building components curved and finished in one location. 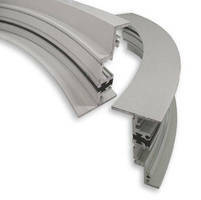 As one of the largest architectural finishing companies in the U.S., Linetec also is one of the only to provide thermal improvement services for curved and radius, finished aluminum extrusions backed with an industry-leading warranty. Offering richer, deeper hues with an intense gold or silver sparkle, Valspar's Nova colors are part of Valspar's Fluropon Effects line of 70 percent polyvinylidene fluoride (PVDF) resin-based architectural coatings. Linetec has selected blue, black, orange and white as samples in booth #1143. These finishes meet the stringent standards of AAMA 2605-13, providing outstanding color and gloss retention, withstanding extreme weathering, and resisting dirt, stains, chalking and fading. Durable finishes, thermal comfort and energy performance can be combined with recycled aluminum content, daylight, views and other environmental benefits for recognition by such green building and design guidelines as the U.S. Green Building System's LEED® certification. For more information about Linetec's thermal improvement, stretch forming and finishing services, please call 888-717-1472, email sales@linetec.com or visit www.linetec.com. Linetec is one of the nation’s largest paint and anodize finishers, and the largest independent architectural finisher. Located in Wisconsin, Linetec serves customers across the country, finishing such products as aluminum windows, wall systems, doors, hardware and other architectural metal components, as well as automotive, marine and manufactured consumer goods. The company is a subsidiary of Apogee Enterprises, Inc. (NASDAQ: APOG). Linetec is a member of the American Institute of Architects (AIA), the Association of Licensed Architects (ALA), the International Interior Design Association (IIDA), the American Architectural Manufacturers Association (AAMA) and the U.S. Green Building Council (USGBC).